A genuine superstar at full back, Pert established himself as one of the greatest defenders of the modern era. While beginning his career at Fitzroy (he would later be named in its Team of the Century), Pert would finish his career as one of Collingwood’s most reliable on and off field figures of the early-mid 1990s, and later returned to the club as its Chief Executive Officer. Originally recruited from Bulleen, in Melbourne’s north-eastern suburbs, Pert made his league debut at the age 16, settling into the Fitzroy side with the temperament of a veteran. He made the Victorian team for the first time in 1984 at the age of only 18, making him the youngest to wear the Big V since Carl Ditterich two decades earlier. Pert’s superb leap and all-round skills meant that he could play anywhere on the field. His early years were spent exclusively in defence and he became one of the best full backs in the game. He could start attacks from the backline and frequently ran off slow-moving, immobile forwards to charge downfield. By the late 1980s, many rated Pert and teammate Paul Roos as being among the best three or four footballers in Australia, but when the financially strapped Lions tried to slash his payments, there was a sad parting of the ways. 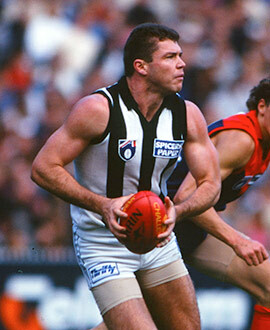 He was subsequently traded to Collingwood, overcoming a serious knee injury to debut in the Black and White jumper against the Brisbane Bears in round two, 1992, winning 21 disposals and taking four marks. He played all 23 games that season and quickly established himself as one of the club’s leaders, teaming well with the likes of Craig Kelly and Michael Christian in defence and finishing runner-up in the Copeland Trophy. Pert remained a regular for another three years, managing two finals in his time at Victoria Park before his career drew to a close in a loss to Sydney in the final round of 1995. In all, he represented Victoria six times and was named in the All-Australian team in 1985. Gavin Brown, in his 1997 autobiography Collingwood Forever, described ‘Perty’ as “the sort of bloke who could one day become an AFL commissioner”. Following his retirement, Pert worked for various high-profile organizations in Melbourne, including Austereo, before he became Collingwood’s Chief Executive Officer in 2007. During his time at the helm, Pert has overseen the club’s 2010 premiership campaign, the growth of membership to beyond 80,000, and the coaching succession plan that saw Mick Malthouse hand over the reins to Nathan Buckley at the end of 2011.